Amazon Web Services provides quite a bit of interesting and useful services, many of which you can use through a number of APIs. One that can be particularly useful for someone using PowerShell is the Simple Notification Service (SNS). It allows you to create push notification endpoints, and then send yourself or others notifications to email, Apple iOS, Amazon Kindle Fire, or other web services. If you're unfamiliar with Amazon's terminology however, it can be somewhat confusing to navigate through all the right screens. Here is a quick tutorial that will show you how to set up SNS, an API user, and then use that information to send yourself notifications. The first time you run it, the shell will ask for the credentials of an IAM user, which is Amazon's way of handling authentication. Make sure you write them down, these are the credentials you will need to use the AWS PowerShell commands. If you pick Email for example, you can enter an email address and notifications for this topic will be sent there. Make sure you confirm your email address. Now that you have a SNS topic created with an endpoint attached, you need to give your IAM user access to it. Go back to IAM under the Services menu, and select the user you created previously. Click on Add Statement, Next Step, and then Apply Policy. Your user now has access to the SNS topic you created. Make sure you use the right region where you created your SNS topic. If all went well, you should receive a confirmation number and your notification should be sent. Otherwise you will get an error telling you what went wrong. 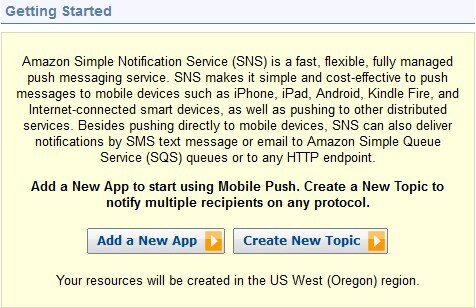 SNS is a great way to send yourself or team members notifications from scripts. You can use it in cases where something break, health checks fail, or in any number of situations. Do keep in mind that SNS isn't free, although it is pretty cheap. 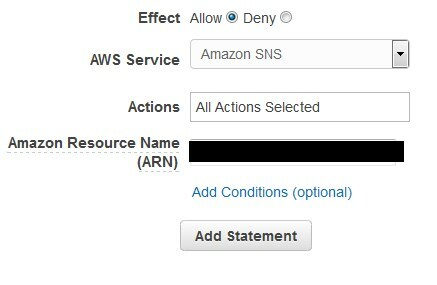 For pricing information and more about SNS check out the AWS SNS documentation.